This 100 Pack is made up from 10 x 10 Tubs (MR468). 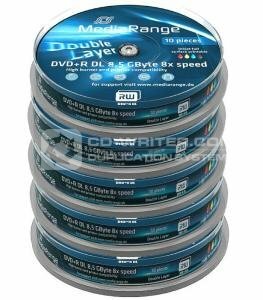 The doubles Layer technology provides nearly the double capacity as a conventional DVD. Through the increase of the data-volume, MediaRange DVD+R DL discs can also be used for high-resolution films in cinema quality with a playing time from over two hours or up to four hours using high-resolution MGEG-2 format. In addition the MediaRange DVD+R DL discs are compatible with DVD-Rom drives and DVD Players. archiving of films in cinema-quality! MR468 . MediaRange . 8x . Double . Layer . White . Printable . Cake . packed . in . 100 . s .